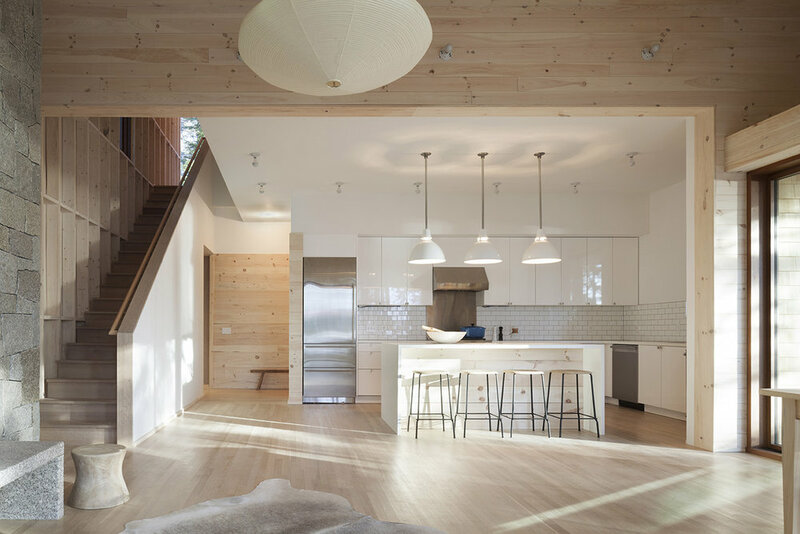 A young family with two growing boys called on us to design a vacation house at the edge of Acadia National Park. The brief required four to five bedrooms and three baths. We were encouraged to embrace a modest expression worthy of the site and to make a structure that would sit lightly on the ground. Our solution comprises a simple “L shaped” plan made up of two structures separated by a breezeway. One volume is winterized and capable of accommodating the entire family for colder seasons, the second is a sleeping wing for summer use. The primary structure is a sloped volume, low, open, and horizontal at the water side, rising to a vertical and solid expression on the eastern, mountain side of the house.